For most of 2017 I have been collecting any article on science comics that I could find and reading extensively about related fields of research such as visual communication, narratives and metaphors. Now I have tried to put it all back together into this long essay for the Journal of Science Communication. There are no comics in it (it was a difficult but deliberate choice) just a lot of references, so it's not exactly a fun read. However, if you are interested in this field and you want a thorough introduction I hope this will be of some help. Now it's time to test some these ideas! Farinella, M. (2018). 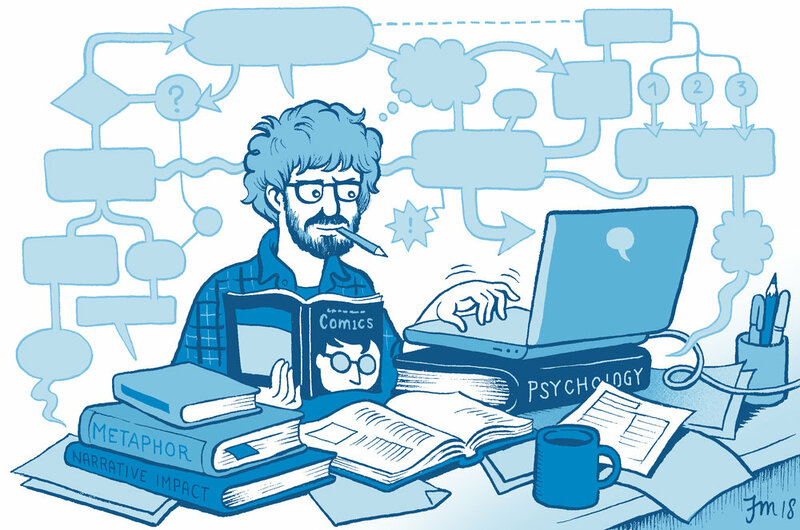 The potential of comics in science communication. J. Sci. Commun. 17, Y01. Some time has passed since my last post, I have been quite busy travelling to conferences and meeting new people. In May I was in Toronto for Fiction meets Science (FmS), an interdisciplinary conference bringing together novelists, literary scholars, science communicators and even (some) practicing scientists. In June I returned to the Graphic Medicine conference, after missing it for the past three years, they are such a great community and a constant inspiration for me! Being exposed to all these different perspectives and approaches to comics, writing and science communication really pushed me to think about what exactly I am trying to achieve with my comics and what do I want to study. One issue that was raised during the FmS conference, which caught me completely unprepared, was the complicated relationships between facts and fiction. The distinction may seem obvious at first but it turned out to be much more complicated when considered across disciplines, mostly because we treat facts in very different ways (as it previously emerged also during the conversation about Evidence, back in April at the Center for Science and Society). As scientists, we often like to think that we deal exclusively with facts (or data). Fabrication of data is - rightfully - considered the deadly sin of scientific research and, in general, we remain very skeptical of fiction (even if our papers often follow an obvious narrative format, the IMRaD: Introduction – Method – Results – and – Discussion - see Olson 2015). This distancing of science from storytelling is something that I often return to and I haven't completely figured out yet... it might be that the supposed 'universality' of science is incompatible with personal narratives (Ziman 2002) or that we simply underestimate the value of stories. Journalists, on the other side, are very aware of the power of narrative and explicitly embrace it in their writing, but they still go to great length to find reliable sources and fact check their information. In these disciplines there is always a clear distinction between facts (i.e. the ‘Truth’) and fiction, which is 'untrue' if not an outright lie. Novelists are supposed to be the master of fiction but - at least those I have met - are very careful to label their stories as fiction and they would never say that they are 'lying' to their readers. Their goal is not to persuade us of a theory (at least not consciously) but to present the perspective of their characters and then letting us reach our own conclusions. This is how the questionable use of fictional ‘endnotes’ and ‘charts’ in Michael Crichton’s State of Fear (presented at FmS by Joanna Radin) can be justified. However, some studies have shown that fiction may be assimilated as facts by the readers (regardless of the labels and the writer's intention - see Gerrig and Prentice 1991, Green and Brock 2000, Marsh et al. 2003) therefore the distinction between 'facts' and 'fiction' may be more important on a moral level than a cognitive one. Then, there is science communication and creative nonfiction, where the boundaries between facts and fiction becomes even more porous and, at times, slippery. This is best exemplified by the infamous case of Jonah Lehrer (discussed at FmS by Lauren Kilian). After becoming a sort of superstar neuroscience ‘explainer’, Lehrer incurred in widespread criticism when it emerged that he had fabricated some quotes to fit his narrative. This was a particularly troubling story for me because as a science communicator I know that we are constantly simplifying or even distorting the subject matter in order to make it more accessible. The issue then is not whether something is fact or fiction but how much are we allowed to compromise factual correctness in order to meet the needs of a narrative? Should we signal this to the readers and - if so - how? Should creative non-fiction about science be avoided altogether? Amidst this fit of self doubt, it occurred to me that comics - once again - may provide an interesting solution to this dilemma. Because comics differ from writing in some very important ways. When reading a piece of journalism, an essay or even a piece of literary fiction, readers - even if unconsciously - seem to have very high expectations of ‘realism’. If a line or a dialogue doesn’t sound real (even if we are aware that it is fiction) the transportation into the narrative world is disrupted. Meanwhile, comics - even when labelled as non-fiction - are clearly not meant to be taken literally. As Scott McCloud (1994) pointed out (and Magritte before him) a drawing, no matter how realistic, will never be the real thing. It is meant and read as a representation, a symbol of that thing. In other words, comics ask the readers to actively participate in the illusion of fiction: believing and not believing what they are reading at the same time. In fact, the fictionality of drawing is a useful resource in science when dealing with objects outside our sensory experience. For example: an ‘atom’ will always be a model (or even a metaphor - Brown 2003) of an atom. We know that the picture is not what a real atom looks like, and yet we understand that it contains useful information about real atoms. When it comes to writing about science then comics and other forms of visual narratives, may facilitate the blending of facts and fictions, without necessarily deceiving the reader. When reading Neurocomic (Farinella and Ros 2013), for example, I assume it is clear to the readers that the Spanish anatomist Ramon y Cajal doesn’t actually live inside the brain and never said the things he says in the comic. This is not the ‘real’ Cajal, he’s the cartoon version of Cajal, and yet the things he say are based on facts. Readers have to draw their own line between facts and fiction. In other words, by constantly exposing their fictionality comics encourage the reader to engage with the content more critically, actively evaluating each piece of information, rather than passively labelling the whole story as fact or fiction. Which, after all, it seems to me a very healthy way to read about science. Brown, T.L. (2003). Making Truth: Metaphor in Science (University of Illinois Press). Gerrig, R.J., and Prentice, D.A. (1991). The Representation of Fictional Information. Psychol. Sci. 2, 336–340. Green, M.C., and Brock, T.C. (2000). The role of transportation in the persuasiveness of public narratives. J. Pers. Soc. Psychol. 79, 701–721. Marsh, E.J., Meade, M.L., and Roediger III, H.L. (2003). Learning facts from fiction. J. Mem. Lang. 49, 519–536. McCloud, S. (1994). Understanding Comics: The Invisible Art (New York, NY: William Morrow Paperbacks). Olson, R. (2015). Houston, We Have a Narrative: Why Science Needs Story (University of Chicago Press). Ziman, J. (2002). Real Science: What it Is and What it Means (Cambridge University Press). As a scientist communicator I couldn’t agree more with the latter point but I still think that anything that takes scientists out in the streets is a good thing. I think a deeper problem, partly responsible for the spread of anti-science movements, is that for decades our academic system has more or less openly discouraged any engagement with social issues, such as politics. Anything that is not devoted to the pursuit of pure knowledge is considered at best a pastime, at worse a sign that you are not serious enough about your research. The result is that scientists, in particular, are often a very insular community, perceived (and depicted) as charmingly detached from everyday problems. It certainly doesn’t help that in this country the ‘campus’ model for universities has created a geographical segregation, in addition to a cultural one. This concept is beautifully expressed with the metaphor of the ‘ivory tower’. I think this divide is particularly relevant for my own research in science comics. I have been lucky enough to receive the support of one of the most respectable academic institutions and I am surrounded by enlightened people who understand what I am trying to do. However, there is no point in denying that in popular culture comics are still very much associated with the idea of cheap entertainment. The result is that there is often a huge gap between the way I think and write about comics in my research, and the way they are actually used in everyday science communication. Many of the studies that I have been reading in the past few months still praise comics mostly for being ‘fun’, ‘easy’ and particularly suitable 'for children’. I know some of these papers are outdated but somehow it is still painful to read statements such as: “unlike the more formal textbook, comic strips are more casual and consumable: they can be cut apart, drawn on, and colored with more freedom.” (J.R. Richie quoted in Gonzáles-Espada 2003). The ultimate question is: will comics be able to become ‘respectable’ enough to be allowed in scientific circles without losing their edginess and irreverence? It’s not an easy balance but, if achieved, it would make comics the ideal medium to cross the walls of the ivory tower and maybe help the many scientists who are planning to run for office. Because of their history, I think that a full analysis of 'science comics' should not simply focus on their educational potential but also address their role in changing the perception of science in our society. González-Espada, W.J. (2003). Integrating physical science and the graphic arts with scientifically accurate comic strips: rationale, description and implementation. Meyer, G. (2016). In science communication, why does the idea of a public deficit always return? Public Underst. Sci. 25, 433–446. Sabin, R. (1996). Comics, comix and graphic novels (Phaidon). Williams, R. (2008). Image, Text, and Story: Comics and Graphic Novels in the Classroom. Art Educ. 13–19. Young, R.S. (2017). A Scientists’ March on Washington Is a Bad Idea. N. Y. Times. I have always been interested in stories about science, but for some reason I never seriously considered narratives from a scientific perspective. The fact that I considered science a worthwhile subject for fiction, but not fiction a worthwhile subject for science, clearly betrays my scientific background. As scientists we often see narratives as a pleasurable distraction, at best, or something to avoid altogether in our work, as a story is considered pretty much the opposite of data. Narratives played an important role in early scientific reports (think of Galileo’s Dialogue) but as science and the humanities drifted apart we abandoned personal accounts in favour of more 'objective' expository texts. This is probably why before starting my project on visual narratives I never asked myself the obvious question: what is a narrative? I was aware of the structuralist approach (Barthes 1975) but I was looking for a more empirical answer. Research in the field of psychology and education suggests that narratives are a fundamental way to acquire and organize information (Bruner 1986) and possibly a way to simulate social experience (Mar and Oatley 2008, Gottschall 2012). There is compelling evidence that narratives are a powerful tool for engagement and persuasion (Green and Brock 2000) and this is why many argue for their use in science communication (Dahlstrom 2014, Olson 2015). All this made me wonder if narratives could be more than just a ‘tool’ but rather a ‘necessity’. Are we, scientists (or academics more in general), deluding ourselves by thinking that we can avoid narratives when presenting our research? If our brains are hardwired to tell stories should we not try to study how they work and how we can use them more efficiently? During the technological boom of the 20th century science was probably a convenient narrative to embrace. Surely it disrupted religion and other traditional values but in exchange it offered a more powerful and simple story: infinite progress (i.e. trust and support science and it will improve your life, forever). Now that we start to face more complex problems (e.g. overpopulation, climate change, neurological disorders) this promise has failed. Science does not offer a linear narrative anymore, nor a simple solution, only an ever growing pile of facts. Is it really so surprising then that people are reverting to fake but simpler stories? After all, this is exactly why religions and other populist narratives have dominated for thousands of years. I am not suggesting that science as a method has failed, but that we - as scientists - may have been mistaken in assuming that a clear exposition of facts should be enough to convince people. Science probably needs stories just like any other system of beliefs. I hope the current debate around ‘fake news’ could be a wake up call for scientists because now more than ever it is important to acknowledge the power of narratives and recognize that fiction is not always the opposite of facts. Good stories can also be true and these are the stories we need to learn how to tell. Barthes, R., and Duisit, L. (1975). An Introduction to the Structural Analysis of Narrative. New Lit. Hist. 6, 237–272. Bruner, J.S. (1986). Actual Minds, Possible Worlds (Harvard University Press). Dahlstrom, M.F. (2014). Using narratives and storytelling to communicate science with nonexpert audiences. Proc. Natl. Acad. Sci. U. S. A. 111 Suppl 4, 13614–13620. Gottschall, J. (2012). The Storytelling Animal: How Stories Make Us Human (Houghton Mifflin Harcourt). Mar, R.A., and Oatley, K. (2008). The Function of Fiction is the Abstraction and Simulation of Social Experience. Perspect. Psychol. Sci. 3, 173–192.